This is my card for the #4 weekly Challenge. 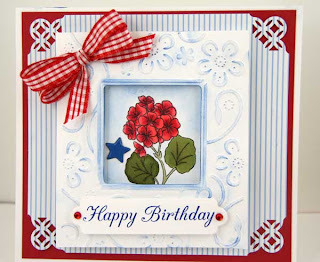 I did not have any stamps that goes with a USA theme, but to me Geraniums say America, so I used the red, white and blue color scheme but in a different way. I hope you like it. Very nice! I think it is a nice alternative to the 'in your face' red, white, and blue. Not that those aren't nice also! Joan, Your card is beautiful! I love Geraniums and the way you framed them really made them pop! Awesome punch work! TFS! This is a very pretty card Joan. Love the colors and the way you put it together! 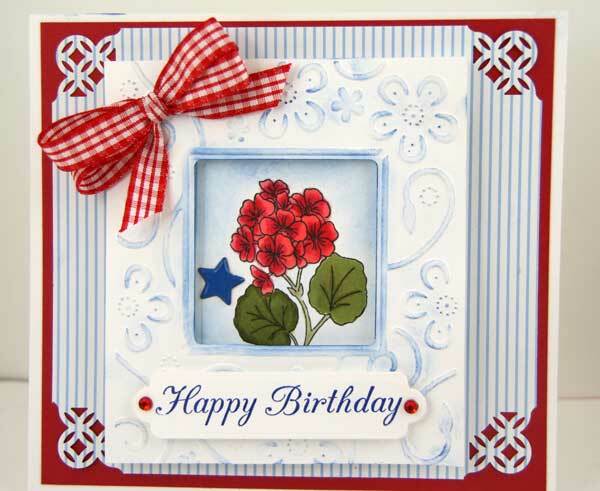 What a fabulous red, white and blue card!! I wanted to play along with the non-patriotic red,white and blue challenge for Crafty Secrets but was feeling a little challenged. Girl you make it look easy! Thanks for the inspiration. BTW I found you through my Crafty Secret gal pal - Darlene Pavlik's blog. You do lovely work! What a beautiful card Joan. You do such loveliness!